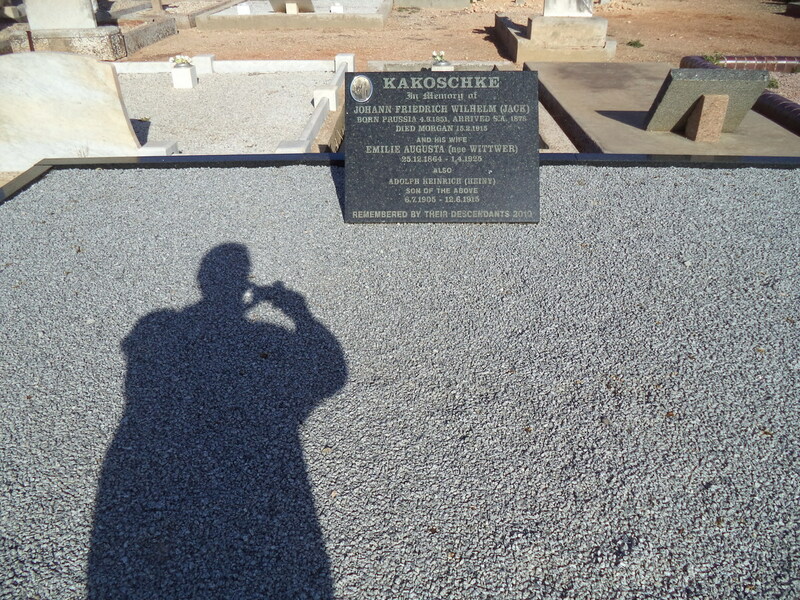 2015 marked the centenary of the death of the original Aussie Kakoschke – Johann Friedrich Wilhelm, better known as Jack. In September, my brother Lex and I had the opportunity to visit the ruins of the old Kakoschke family home, out on the plains in the Hundred of Lindley, near Morgan in South Australia. 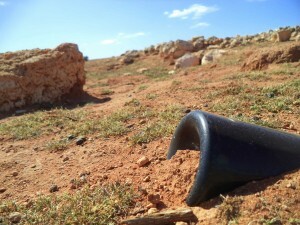 It’s such desolate countryside. 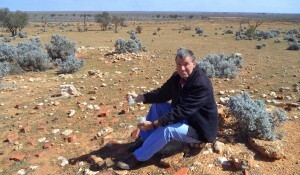 The only things that thrive are crows, saltbush and shingleback lizards. It’s hard to imagine how they survived farming out there for almost 30 years. The Murray River is about 17 kilometres away as the crow flies, and I’ve been told that the children routinely had to walk to the river to fetch water. 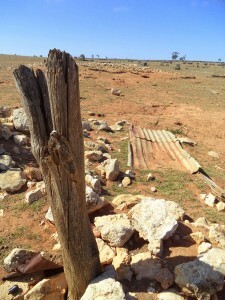 There’s almost nothing left of the original buildings – a three roomed house, a cellar, a wool shed and a cart shed. Imagine raising 18 children in a three roomed house – not three bed-roomed, three roomed! Family lore has it that three children are buried near the house, although there are no marked graves. 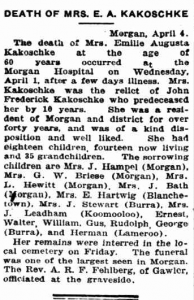 Records only mention one infant child, Hannah, dying in 1884. But there may have been others which weren’t registered. Family lore also has it that old Jack had something of a temper, and that at times his wife Emilie and the younger children would climb up onto the roof to escape his wrath! I don’t know whether that’s true or not. If it is, I’m sure it was no laughing matter at the time, but somehow all these years later, when I closed my eyes and imagined the scene – old Jack, standing with bottle in hand, shouting and cussing away in German, Emilie and the children perched up on the rickety roof, the ladder safely beside them, I found myself smiling. Bottles, bottles everywhere, and ne’er a drop to drink! They were tough people, and they were survivors. True Aussie battlers. Jack passed away in the cellar at the farm on the 15th of February 1915, at the age of 63 – a pretty good innings for those times. The primary cause of his demise, as stated on his death certificate, was chronic alcoholism syncope. Sounds like the old home brew might’ve been pretty rugged stuff. 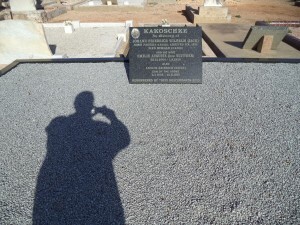 -In loving memory of my dear husband and father, Johann Friedrich Kakoschke, who died at Lindley on February 15, 1915. We miss the sunshine of thy face. 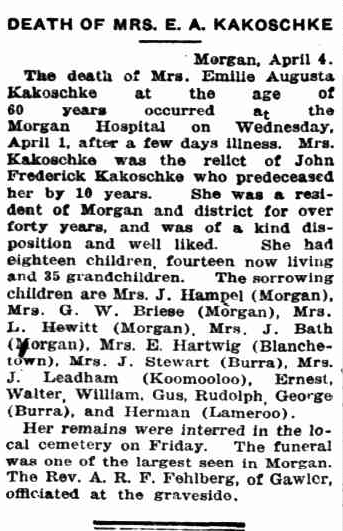 Emilie moved into the town of Morgan after Jack’s demise and spent the rest of her days there, passing away on the 1st of April 1925 after a few days illness. She was a well respected and much liked member of the community. As there was no hearse in the town, Emilie’s mortal remains were taken to Morgan cemetery in the back of a truck. May your souls rest in peace great grandpa Jack and great grandma Emilie.